Paul Morgan Architects crowns an iconic Melbourne market with a pragmatic and elegant roof that speaks directly to the local vernacular. 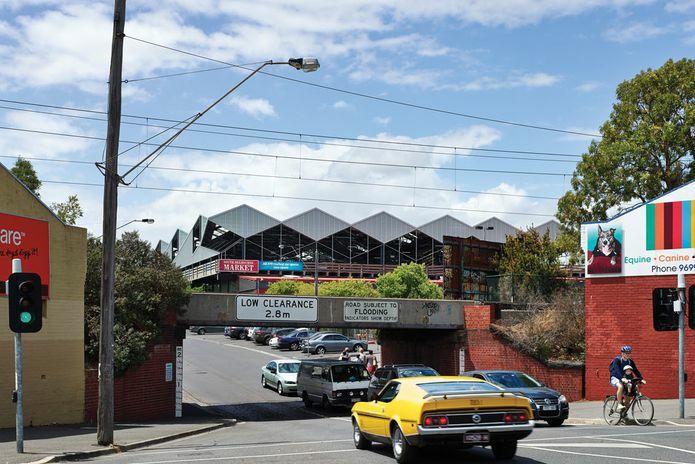 The new roof speaks to the South Melbourne’s industrial past. In a climate of financial conservatism and uncertain global economic growth, the role of the architect – seen by some as providing a luxury service or commodity – demands a degree of entrepreneurial and formal dexterity, a rethinking or at least bringing to the fore what architecture can offer. Architecture has always had a public and social responsibility. 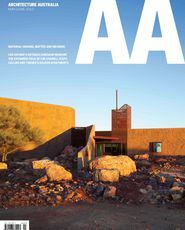 For the industry to survive economic decline demands that architects expand on these broader roles, through formal and programmatic inventiveness, resourceful use of material and structure and an awareness of the wider urban significance of individual projects. 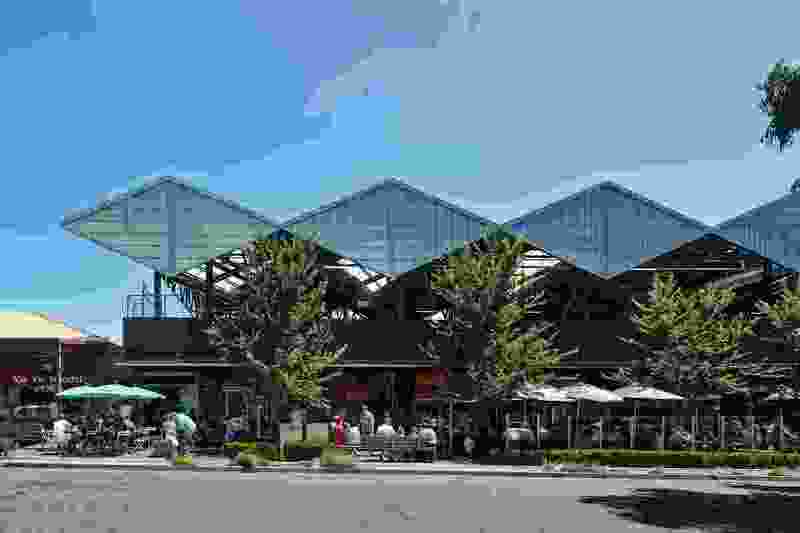 The new roof for South Melbourne Market, by Paul Morgan Architects (PMA), is one such project. It began with a relatively simple brief – to provide a new roof structure that would address the existing building’s problems of leaking and an unsustainable heat load. 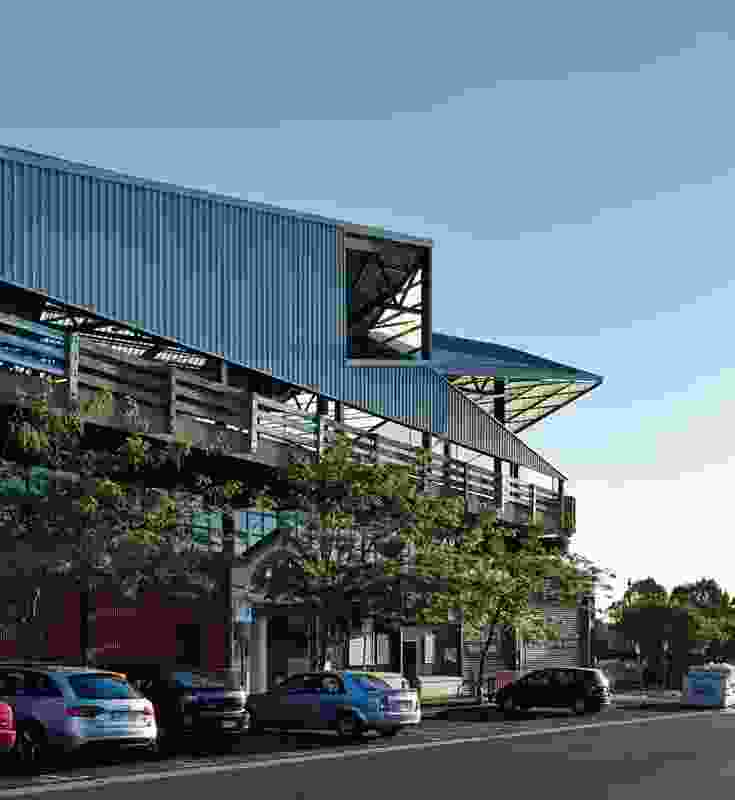 Commissioned by the City of Port Phillip, PMA was first given a proposed engineer’s section for the scheme and asked to document and build that while addressing the requirements of the brief. However, the significance and size of the area – approximately eight thousand square metres, the council’s second largest urban development after the St Kilda Triangle site at ten thousand square metres – suggested to PMA that this would be an urban insertion of considerable importance and therefore more attention should be given to its overall design. So while at one level this is just an elegant, pragmatic roof structure, it is also a sophisticated addition to the urban landscape. It speaks to and inventively transforms South Melbourne’s industrial context of lightweight sawtooth buildings and effectively “brands” the business of the market. 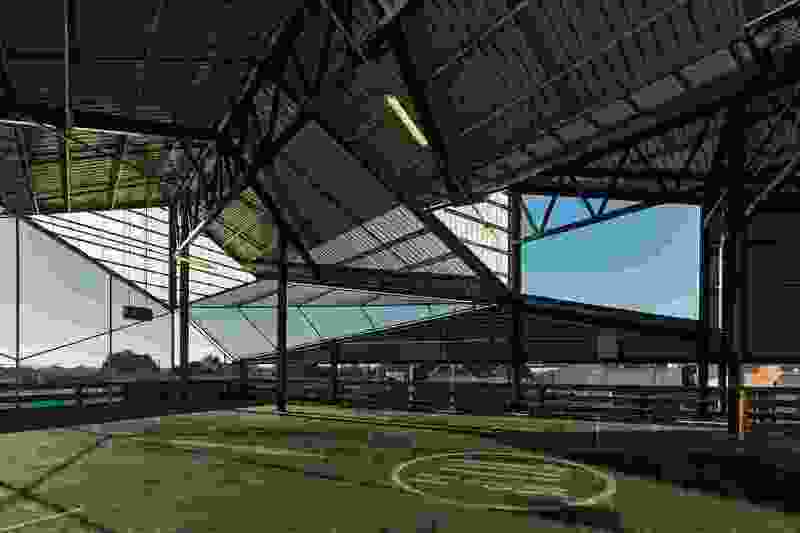 An economical and thoroughly standard material palette of steel trusses, metal deck, polycarbonate cladding and off-the-shelf chain mesh was used in PMA’s expressive manipulation of the industrial type. The formal language of the project follows the trajectory of the office’s oeuvre – a well-established series of economical yet dynamic institutional, residential and public buildings. It also draws on design and project architect Paulo Sampaio’s interest in architectural typology and PMA’s ongoing studies of contextually resonant architecture. The northerly orientation is ideal for the building’s PV (photovoltaic) panels. As director Paul Morgan says, “We see Melbourne as a young Western city, a potential site for experimentation unlike a European city that needs to be wedded more strictly to typology and fabric.” PMA uses context and site as a starting point but in an experimental and exploratory manner, directed at form finding in context rather than strictly following and replicating the existing rules. And so in South Melbourne, the suburb’s relationship to the Melbourne city grid and to the greater Melbourne grid became a generative formal device. Diamond forms characterize the eastern and western facades. Morgan, who has previously studied the history of the city’s organizational grids and layout in his master’s degree project work at RMIT University (published in 38 South), noted that the orientation of the South Melbourne grid was a remnant of Robert Hoddle’s Melbourne CBD grid. 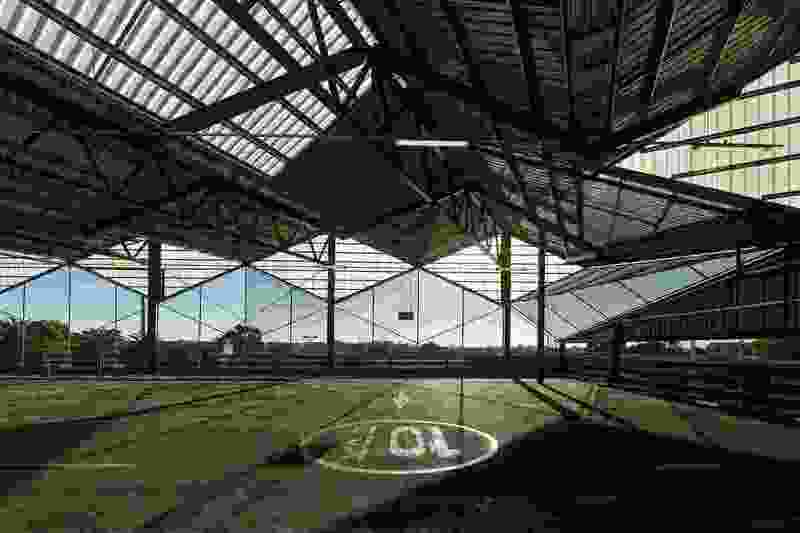 The architects began by orientating the roof’s framing structure to that system. Then they shifted the orientation to that of the greater Melbourne grid. This slide of orientation yielded a series of expressive triangles and rhomboids that became openings for light and views while continuing the reference to South Melbourne’s industrial sawtooth buildings. The northerly orientation is also ideal for PVC solar panels and the City of Port Phillip’s longer-term carbon-neutral ambitions for the project. Shadows cast through the steel structures form a kinetic pattern. The result is undeniably strong. 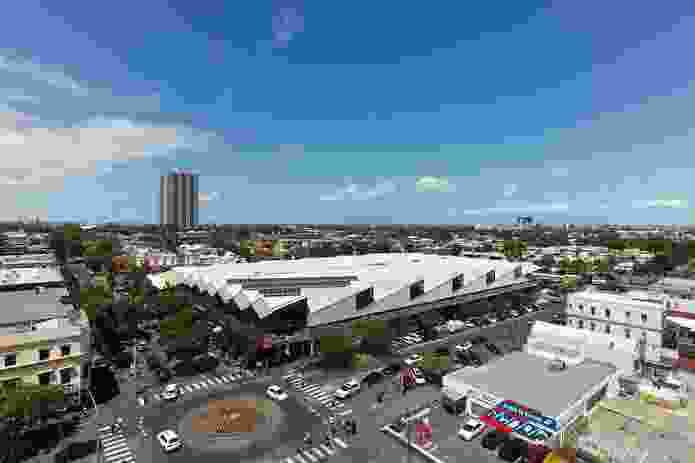 These geometrically clear and expressive moves – reading as triangulated diamond forms on the eastern and western facades and then more abstracted rhomboid shapes on the sawtooth facade of the north elevation – make for a very satisfying and strong architectural statement and identity for the South Melbourne Market. Where the two different geometric systems meet at the building’s corner, a particularly sculptural moment occurs, what the architects call the “open bird’s mouth corner.” From within the structure on the market’s roof slab where the car park is held, views out to the city and skyline are variously framed by the collision of these three-dimensional geometric openings. Shadows cast through the steel structures form a kinetic pattern dispersed across the car park’s concrete surface. PMA’s South Melbourne Market roof, with its formal clarity and economic structure, continues the very rich expressive formalism and contextual dialogue for which Melbourne architecture is renowned. In a tradition that includes Carey Lyon, Gregory Burgess, Edmond and Corrigan, and Ashton Raggatt McDougall, this is architecture that privileges ideas – ideas of and for the city and for the broader discourse of architecture – all given shape in deftly inventive and economical applications of material, structure and form. At one level this project is simply a roof for a car park. It is just columns and a roof, very minimal and requiring a minimal number of subcontracting trades. But as they said, “PMA took the view that the architectural intent, the presence in the urban fabric, shouldn’t be minimized even though it was a straightforward project. So those moves, understood in terms of their relationship to the sawtooth roof and the industrial type in South Melbourne, become very prominent on the elevations and as an architectural expression.” The project indeed plays a strong urban role and will provide a branding for the market and the City of Port Phillip. An “open bird’s mouth corner” where the two geometries meet.